Our very first Concert -3.00 pm Sunday, 4 April 2009 . I opened the occasion by playing the National Anthem to an invited audience of supporters, friends and family. The concert was led by a good friend of mine, Tony Bunting, who had supported me with my ideas while I was still at High school. There were four pianists on the day and each played for 5-10 minutes with Tony interviewing me between performances. with me playing the closing piece. National TV filmed the event and reporters were present from the local papers. Bronwyn Judge of Frilly Productions created a DVD of the event. The atmosphere was filled with buzzing energy, and the weather on the day was none other than the best, being warm and fine with no wind. We had the shed doors open to a view of Mt Horrible, and there was a feeling of magic in the air. That day was a truly memorable occasion shared with friends and supporters. The second concert saw another fantastic day. This was our first public event with a great turnout of people. They brought their own chairs as they had done for the first concert and the audience was able to sit outside in the sun enjoying live music, whilst surrounded by the beautiful scenery of Alpine Farm. The concert was compered by Papanui High School’s Head of Music, David Pitt. We had a good variety of performers who presented different styles of music. A chook noisily laid an egg during one of the recitals. This was hilarious and it delighted the audience. The proceeds of the concert were shared between Adrian Mann and the St Mary's Church Restoration Trust. DVDs of the inaugural concert were also sold for the first time. A relaxing but deeply emotional session with Dr Gertrude Fester of Cape Town, south Africa sharing her stories while I supported her in music. Gertrude was imprisoned for two years for speaking out during the time of the apartheid struggles in South Africa, three months of this being spent in solitary confinement. Gertrude composed songs, poems and plays in her mind which she wrote down once she was released. It is a testament to her strong character that she was able to do this at such a difficult time. The concert was organised at quite short notice, was well attended and the audience was held ‘spellbound.’ Thank you Gertrude. This concert was arranged in two days and it was surprising how many people attended. I was first on the list. A late entry was Kevin Hickman who we found camping at the river while we were doing our last minute local advertising. Kevin plays for the New Zealand Army Band and he was launched into the concert as he was, crocs and all. Kevin played some great solo pieces on his trumpet and cornet. Our final performer was the famous singer Ramonda Te Maiharoa from Italy. Ramonda sang wonderful music from many genres. 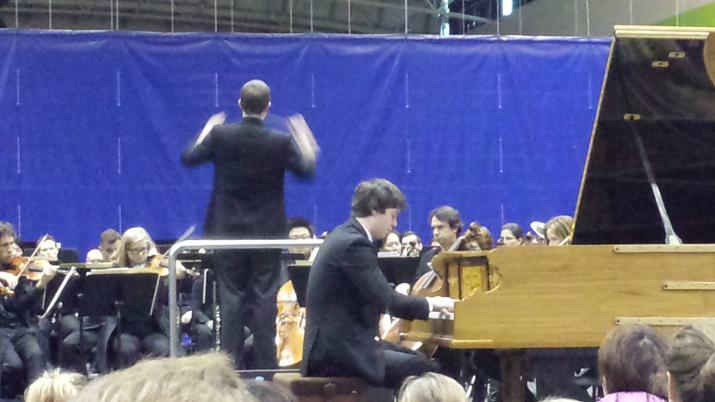 "His music captivated the audience with his amazing virtuosity." 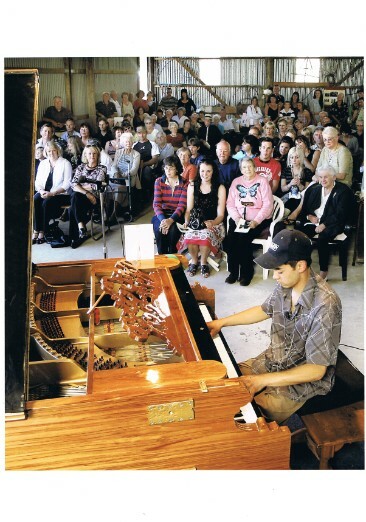 Artur Cimirro, a Brazilian concert pianist, with an interest in pianos with unique developments, came especially to New Zealand at the end of his Australian tour - to hear and play the Alexander Piano. Artur contacted me through a friend in Auckland with a request to give a concert on the piano. Plans were made and soon we were planning our first concert with an International Concert Pianist! Wow! The public responded and we sold enough tickets to have two full concerts. The mayor and national television station and the papers were all there. Artur played exceptionally well, in spite of the mid winter climate, inside the unlined shed. The first concert was held at 3.00 pm and the second at 5.00 pm. One concert goer, Oscar, a 5 year old boy, went up mid concert to see the inside of the piano, and then to the far end to see the man who was making the sound. Artur was performing a difficult passage at this stage. I'll never forget it. Without missing a note, Artur turned and smiled at Oscar, while continuing to play. It was amazing, something you would never see in a town hall. Artur is a highly commendable musician and composer. Bravo! Maurice Till was a legend in New Zealand. My three meetings with him were indeed, memorable. 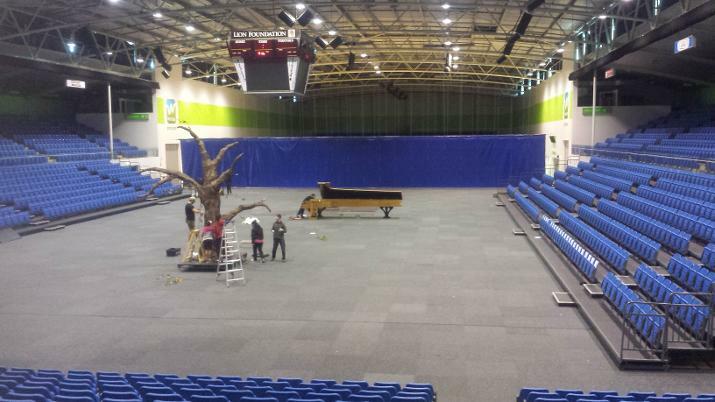 I approached Maurice and invited him to see and play the giant piano. He showed an interest in what I'd done and after I answered a few questions, he accepted with a smile. We exchanged emails and I sent him a more formal invitation. 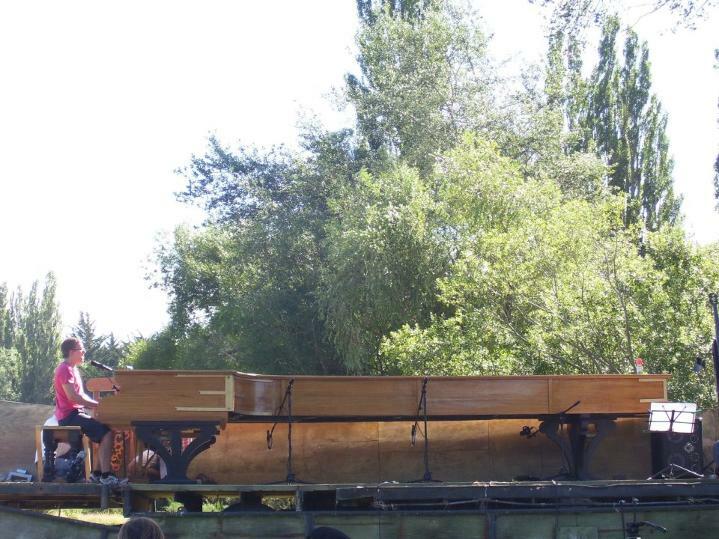 Maurice was due to visit the piano on 4 September 2010 as he was driving down from Christchurch, with his son Richard, to perform in a concert in Timaru. Early that morning the devastating Christchurch earthquake hit and understandably plans had to be changed. We now thought the concert was probably not going to take place but Maurice didn't let Timaru down. People were in awe when he arrived at the venue that night, ready to perform, having driven through dangerous damaged roads and leaving a damaged home. However, due to the circumstances, Maurice did not visit my piano on this occasion but he did on a later one. When I was notified that he was coming, I phoned a few friends and we all gathered at The Shed. It was Saturday 13 November 2010. Maurice arrived, escorted by Jan Prestidge. He sat at the piano (lid shut). We were all waiting in anticipation. He proceeded to play a small Chopin piece, and at the end Maurice looked up at me and said with a great big smile “it really does sound like a piano". I opened the lid while Maurice was asked if he could play ‘Romance’ by Schubert which he did. Maurice asked me to play something so he could hear the piano and I played 'New York State Of Mind' followed by 'Scriabin’s Etude Op. 8 No 12'. He had a cup of tea and a biscuit while telling us his fantastic stories. It was a truly amazing experience which I will never forget! Playing Bach's Goldberg Variations - 11 March 2012 3.00PM Alpine Farm.